CTFishTalk.com: recommendation for charter? 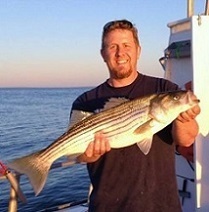 - Connecticut Offshore Reports ( CT Offshore Reports ) - A Community Built for Connecticut Fisherman. Viewing Topic: recommendation for charter? Posted: Fri Aug 16, 2013 10:02 am Post subject: recommendation for charter? I would ilke to tap into your knowledge base. I'm looking to take the parents and grandkids out for a fishing charter trip. Can any of you recommend someone I can use and relate your experiences? I live in the New Haven area and would like something that isn't a trek to the corner of the state if possible. I'd be happy with porgies, fluke, or an occasional striper. Kids love quantity of quality. A buddy of mine runs Blue Venture Charters in New London. Not sure if that's too far for you or not. Great guy, always catches fish. Check him out online! We had good luck with the Sunbeam charters out of Waterford. Captain did a great job putting us on stripers and the mate was excellent handleing gear/fish and providing tips. Sounds like a lot of the charters are out of Niantic or the New London area. That's a trek for me with family of 6 and I was hoping to get something closer to New haven or Clinton if possible. More interested in quantity than quality fish... even porgies in mass quantities. Any suggestions for the central Connecticut area? Book a charter with rock n roll charter out of Clinton. Great boat , great crew. Big comfortable boat. Another option close by would be the party boat The middlebank out of captains cove in Bridgeport. Rock nRoll charters would be your best bet , they catch a lot of fish. I second the Rock n Roll recommendation. TJ is a great captain and he has a great mate. He loves to use the down down rigger, which means less jigging for the kids. The steam out of Clinton was less than 30 min which resulted in more time fishing. I would look into a porgy trip on the Mijoy out of New London. They aren't the biggest but if your on the fish you'll catch atleast 30 a piece and have a blast catching them. Whatever fish or boat you decide on I would definetly make sure the boat is not at capacity. Nothing is worse then a day on a crowded charter boat.